In any other country in our continent, the police look after public and private property, and their mission, with rare exceptions, is not concerned with politics. There, the police have an important role to fulfill. Here, on the other hand, things are different. The greatest number of infractions of the law occur in the central areas of the city of Havana. And it is there where the ordinary citizen is most defenceless in the face of the arbitrariness and ignorance of the cops, who have as a weapon the ignorance and fear of their victims. The lawyers and other agents of civil society ought not to confine their activities to the area in which they live, but should also cover areas like Habana Vieja where every day dozens of persons are handcuffed and humiliated just on the basis of mere suspicion, often based on the color of their skin or the way they speak. A few Sundays ago, in Parque Central, I witnessed how they violated the rights of Antonio Loriste de la Cruz, whose ID number is 73110129509. He has black skin, and his only offence was to cross Parque Central at about 11:53 am. I was able to obtain these details from him and before he was handcuffed by his pursuer no.744, I was able to give him a document which set out the rights which applied to him from the moment of his detention, in accordance with the Law of Criminal Procedure. Although I was assured by the officials who detained him that we were dealing here with a hustler, with someone who is pestering tourists, I can say, as someone who works in this precise location and looks out for the rights of people like Antonio, that I haven’t seen him pestering anybody, but that he was a suspect based on the color of his skin which in Cuba is an indicator of being a thief, a stigma, a cross which he will bear until the day he dies. 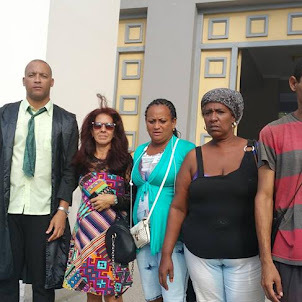 Antonio Loriste was found sitting in the shade on a bench in Parque Central, sheltering from the stifling heat, and there he was bothered by two uniformed police, who asked him for his documents, a very common form of invasion of privacy in Cuba. Antonio Loriste was taken to the premises in Calle de Dragones, an office they euphemistically call “for recognition.” Where they will take him is uncertain.